Sometimes it's kind of tricky to translate the name of Asian style dishes into English, especially when trying to keep the name as simple and short as possible. Softly scrambled eggs might be the closest translation for the recipe here. What I mean by "softly" is not to stir the eggs too much. 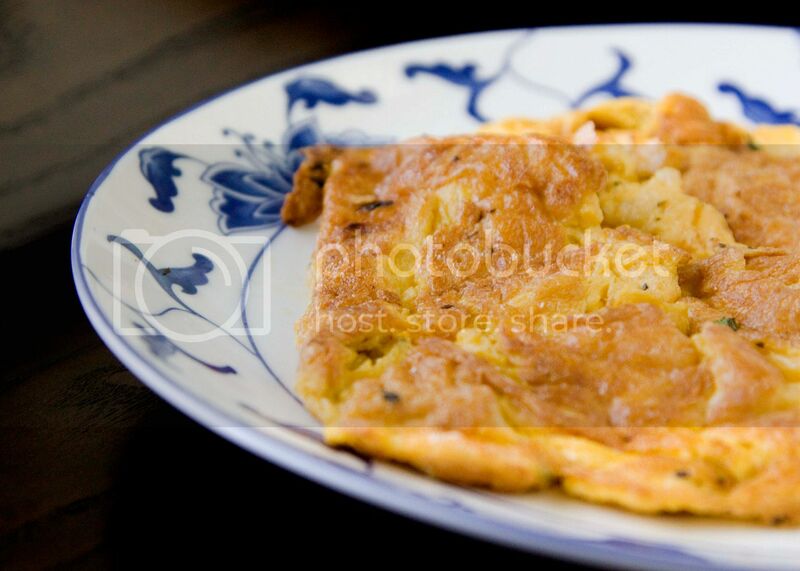 The scrambled eggs should be in large pieces, which will hold the Thai sauce well and easy to pick up with chopsticks. Peel and give the garlic a good chop. 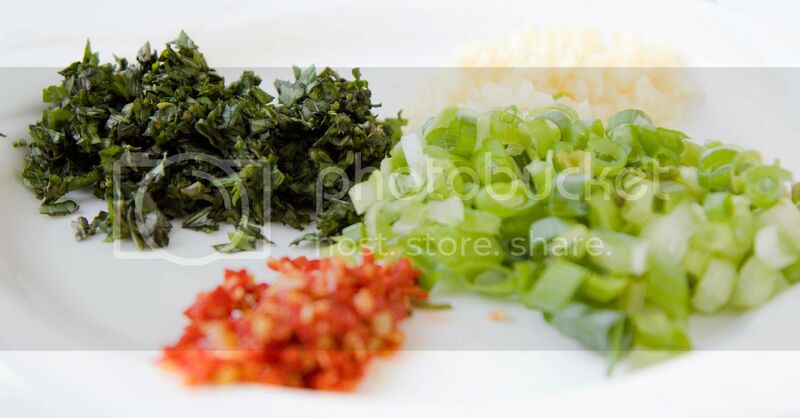 Discard the stems of the scallions and red chilies, chop the remaining into smaller pieces. 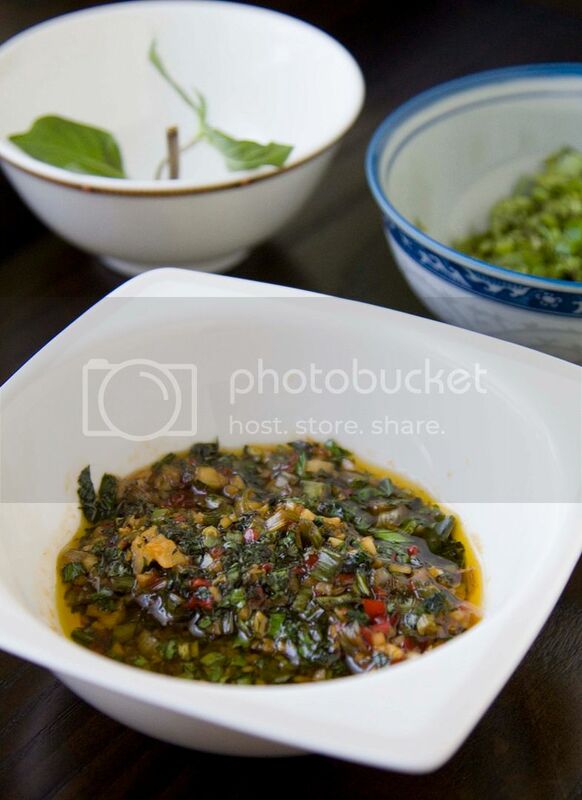 Take the basil leaves and chop into smaller pieces, we need about 2 tablespoons of chopped Thai basil for this recipe. Break 4 eggs into a big bowl. Add about 1 tablespoon of water along with one small pinch of salt, beat well and set aside for later use. Drizzle about 2 tablespoons of olive oil into the pan and turn to medium high heat. Quickly add in chopped garlic, chilies, and scallion. Cook till the aroma comes out but not burning the garlic. Pour in the soy sauce along the side of the pan, the heat on the sides will further enhance the aroma. Also add in the fish sauce, 1 tablespoon of hot water, and brown sugar. Cook till the sauce has been reduced a little bit then add in chopped Thai basil. Give it a quick stir and cook for about another 20 seconds. Pour the sauce to a container and let's start making the eggs. Add about 2 more tablespoons of olive oil to the same pan and wait till the oil gets pretty hot. Pour in the egg mixture and let it sear for a little bit first before start stirring the mixture. Gently scramble the eggs till both sides get a slightly browned color. You can even just sear the eggs as one big piece, like an omelet, but be careful when flipping the eggs to the other side. 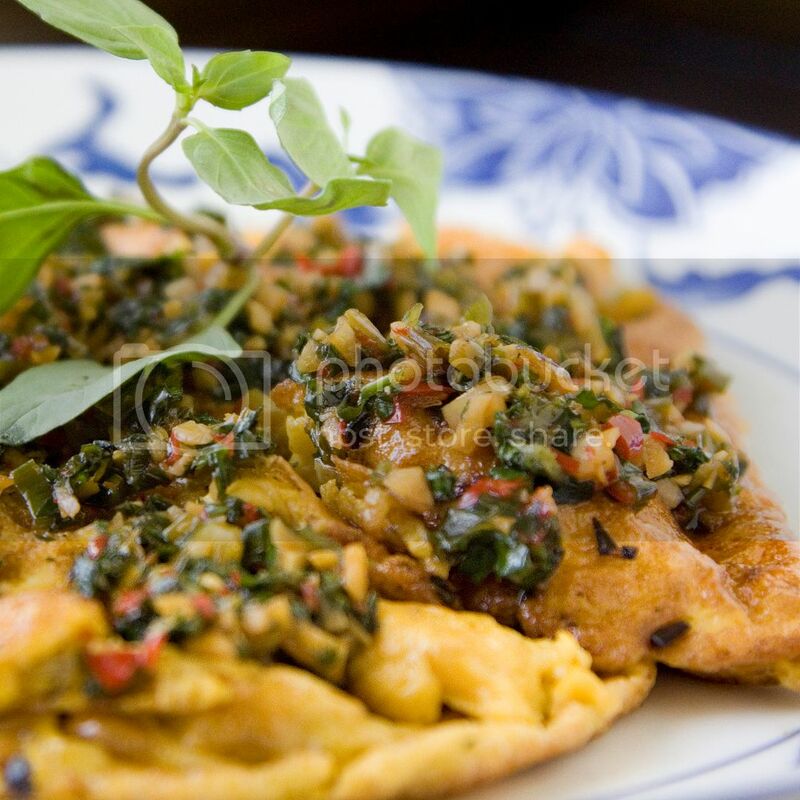 Once done, slide the eggs onto a plate and pour the Thai basil sauce all over. Lastly, garnish this pungent, rice-killing food with some fresh Thai basil leaves. Be sure to have some extra steamed white rice on the side. 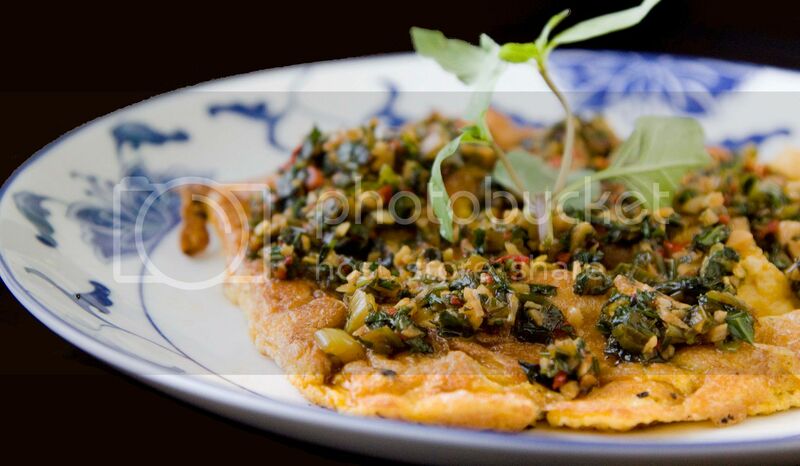 You can also use the sauce with other ingredients such as seared fish fillet or shabu beef slices. It can even be used with steamed broccoli, making a rather bland vegetable full of pungent Asian kicks! Yes you understand!! I love 烘蛋!!! Maybe I should try to make a western style 烘蛋 next time!